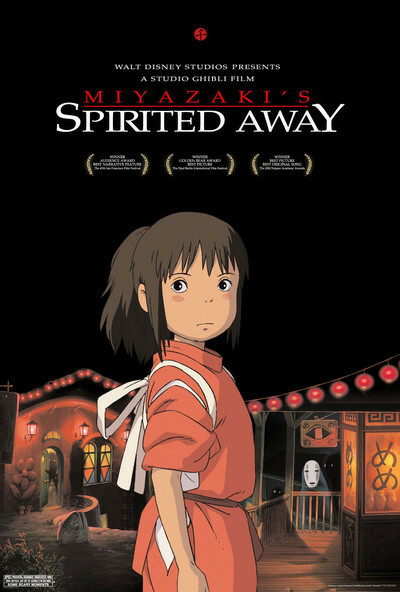 Viewing Hiyao Miyazaki's "Spirited Away" for the third time, I was struck by a quality between generosity and love. On earlier viewings I was caught up by the boundless imagination of the story. This time I began to focus on the elements in the picture that didn't need to be there. Animation is a painstaking process, and there is a tendency to simplify its visual elements. Miyazaki, in contrast, offers complexity. His backgrounds are rich in detail, his canvas embraces space liberally, and it is all drawn with meticulous attention. We may not pay much conscious attention to the corners of the frame, but we know they are there, and they reinforce the remarkable precision of his fantasy worlds. "Spirited Away" is surely one of the finest of all animated films, and it has its foundation in the traditional bedrock of animation, which is frame-by-frame drawing. Miyazaki began his career in that style, but he is a realist and has permitted the use of computers for some of the busywork. But he personally draws thousands of frames by hand. "We take handmade cell animation and digitize it in order to enrich the visual look," he told me in 2002, "but everything starts with the human hand drawing." Consider a scene in "Spirited Away" where his young heroine stands on a bridge leading away from the magical bathhouse in which much of the movie is set. The central action and necessary characters supply all that is actually needed, but watching from the windows and balconies of the bathhouse are many of its occupants. It would be easier to suggest them as vaguely moving presences, but Miyazaki takes care to include many figures we recognize. All of them are in motion. And it isn't the repetitive motion of much animation, in which the only idea is simply to show a figure moving. It is realistic, changing, detailed motion. Most people watching the movie will simply read those areas of the screen as "movement." But if we happen to look, things are really happening there. That's what I mean by generosity and love. Mikayazi and his colleagues care enough to lavish as much energy on the less significant parts of the frame. Notice how much of the bathhouse you can see. It would have been quicker and easier to show just a bridge and a doorway. But Miyazaki gives his bathhouse his complexity of a real place, which possesses attributes whether or not the immediate story requires them. The story of "Spirited Away" has been populated with limitless creativity. Has any film ever contained more different kinds of beings that we have never seen anywhere before? Miyazaki's imagination never rests. There is a scene where the heroine and her companion get off a train in the middle of a swamp. In the distant forest they see a light approaching. This turns out to be an old-fashioned light pole that is hopping along on one foot. It bows to them, turns, and lights the way on the path they must take. When they arrive at a cottage, it dutifully hangs itself above the gate. The living light pole is not necessary. It is a gift from Miyazaki. His story involves a 10-year-old girl named Chihiro, who isn't one of those cheerful little automatons that populate many animated films. She is described by many critics as "sullen." Yes, and impatient and impetuous, as she's stuck in the back seat during a long drive to a house her parents want to examine. Her father loses the way in a dark forest, and the road seems to end at the entrance to a tunnel. Investigating it, they find it leads to an abandoned amusement park. But at dusk, some of the shops seem to reopen, especially a food shop whose fragrances steam into the cool air. Her parents fall eagerly upon the counter jammed with food, and stuff their mouths. Chihiro is stubborn and says she isn't hungry. Her parents eat so much they double or triple in size. They eat like pigs, and they become pigs. These aren't the parents of American animation, but parents who can do things that frighten a child. The amusement park leads to a gigantic floating bathhouse, whose turrets and windows and ledges and ornamentation pile endlessly upon themselves. A friendly boy warns her to return, but she is too late, and the bathhouse casts off from the shore. Chihiro ventures inside, and finds a world of infinite variety. She cannot find her way out again. The boy says everyone must have a job, and sends her to Kamaji, an old bearded man with eight elongated limbs, who runs the boiler room. He and a young girl advise her to apply to Yubaba, who owns the bathhouse. This is a fearsome old witch who exhales plumes of smoke and a cackling laugh. This is the beginning of an extraordinary adventure. Chihiro will meet no more humans in the bathhouse. She will be placed under a spell by Yubaba, who steals her name and gives her a new one, Sen. Unless she can get her old name back again, she can never leave. One confusing space opens onto another in the bathhouse, whose population is a limitless variety of bizarre life-forms. There are little fuzzy black balls with two eyeballs, who steal Sen's shoes. Looming semi-transparent No Faces, who wear masks over their ghostly shrouds. Three extraordinary heads without bodies, who hop about looking angry, and resemble caricatures of Karl Marx. There is a malodorous heap of black slime, a river creature whose body has sopped up piles of pollution. Shape-shifting, so common in Japanese fantasy, takes place here, and the boy who first befriended her is revealed as a lithe sea dragon with fierce fangs. Sen makes her way through this world, befriended by some, shunned by others, threatened by Yubaba, learning as she goes. She never becomes a "nice girl," but her pluck and determination win our affection. She becomes determined to regain her name and return to the mainland on a daily train (which only runs one way). She wants to find her parents again. Miyazaki says he made the film specifically for 10-year-old girls. That is why it plays so powerfully for adult viewers. Movies made for "everybody" are actually made for nobody in particular. Movies about specific characters in a detailed world are spellbinding because they make no attempt to cater to us; they are defiantly, triumphantly, themselves. As I watched the film again, I was spellbound as much as by any film I consider great. That helps explain why "Spirited Away" grossed more than "Titanic" in Japan, and was the first foreign film in history to open in the U. S. having already made more than $200 million. I was so fortunate to meet Miyazaki at the 2002 Toronto film festival. I told him I love the "gratuitous motion" in his films; instead of every movement being dictated by the story, sometimes people will just sit for a moment, or sigh, or gaze at a running stream, or do something extra, not to advance the story but only to give the sense of time and place and who they are. "We have a word for that in Japanese," he said. "It's called 'ma.' Emptiness. It's there intentionally." He clapped his hands three or four times. "The time in between my clapping is 'ma.' If you just have non-stop action with no breathing space at all, it's just busyness." I think that helps explain why Miyazaki's films are more absorbing than the frantic action in a lot of American animation. "The people who make the movies are scared of silence" he said, "so they want to paper and plaster it over," he said. "They're worried that the audience will get bored. But just because it's 80 percent intense all the time doesn't mean the kids are going to bless you with their concentration. What really matters is the underlying emotions--that you never let go of those. "What my friends and I have been trying to do since the 1970's is to try and quiet things down a little bit; don't just bombard them with noise and distraction. And to follow the path of children's emotions and feelings as we make a film. If you stay true to joy and astonishment and empathy you don't have to have violence and you don't have to have action. They'll follow you. This is our principle." He said he has been amused to see a lot of animation in live-action superhero movies. "In a way, live action is becoming part of that whole soup called animation. Animation has become a word that encompasses so much, and my animation is just a little tiny dot over in the corner. It's plenty for me." It's plenty for me, too.